Less flashy than sunnier neighbors, shade gardens can seem dull at first glance. A closer inspection, however, reveals the opposite is true: form and texture can combine to create stunning visual interest in the shadiest of gardens. If you are a savvy gardener, you will also recognize the rich green tones of a shade gardens as a great setting for outdoor decoration. From paths and patios to birdhouses and statues, a shade garden is the perfect place to nestle garden decorations where they will be noticed. 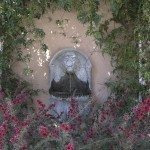 Incorporating appropriate decorations into your garden design will add personality, beauty, and in some cases, functionality, to your garden retreat. By rotating your garden accessories each season, you also can dramatically change the look and feel of your shade garden with minimal effort. Accessorizing your shade garden should be fun. Try to envision what you want to achieve in your shade garden. Will the garden be something pretty to look at, or will you be spending time there? Would you like to attract birds to the area? How will you move around? Paths are an excellent way to move around your garden, whether for enjoyment or for maintenance. 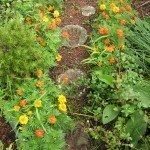 In addition to being functional, a winding path can be a beautiful foil for the lush green foliage found in shade garden borders. There are a number of materials you can use to create a path, with each one creating a different mood in your garden. Try creating a simple path topped with pine needles or perhaps a more formal brick-lined path. Larger garden decoration elements such as gazebos, patio furniture or ornamental stones, can be a focal point in your garden. Plan these elements carefully; they are much harder to adjust than smaller elements like potted plants or wind chimes and are more likely to become permanent fixtures in your shade garden. Simple accent lighting can be installed in a matter of minutes and will have a huge impact on your shade garden’s appeal at night. Decorative lights lining a pathway or highlighting another garden decoration would be especially lovely. Design gurus will tell you a garden should be treated like an outdoor room, with different areas used for specific purposes. While there is validity to that statement, it is far more important to create a shade garden you love. Whether that means installing a simple tree swing or populating your garden with bright pink flamingos, let your shade garden accessories reflect your personality and likes. A designer garden looks fabulous in a magazine, but if that’s not what you want, it shouldn’t be what you try to create. Look in books or online to find other shade garden decoration ideas. Take note of other gardens in your community, too. Chances are your neighbors have found an interesting way to accent their own shade gardens.